Mercedes heavily plugged its F 015, which sounds like a very tiny Ford truck more than a luxury autonomous car, according to a New York Times writer. 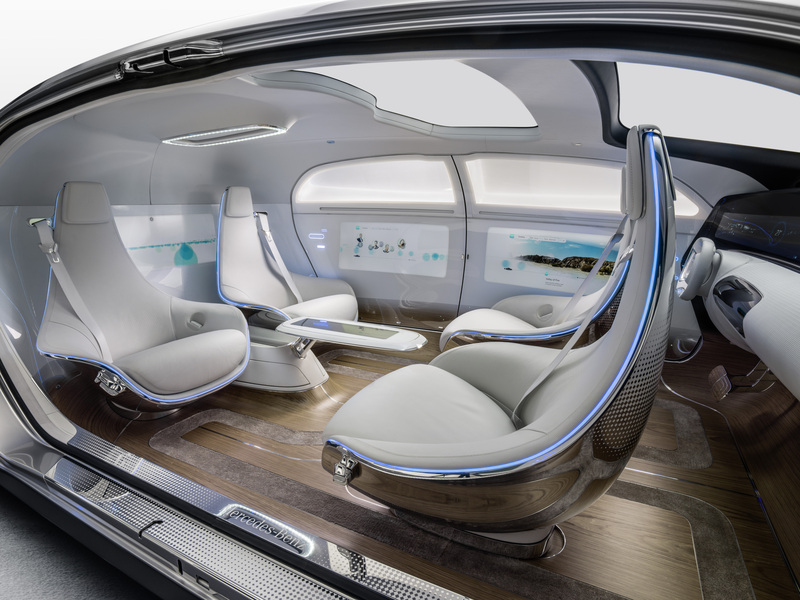 According to Mercedes, the car includes rotating passenger seats, kind of like what you see in luxury planes, carrying passengers who can use touchscreens, gestures, or eye motions to control the car. According to Mercedes, it will run on some sort of combination of fuel cells and battery. Its body is made up of a composite of carbon fiber, aluminum and high-strength steel — which could make for more difficult repairs. One Slate writer questioned whether or not a Mercedes S-Class would really resemble the F 015 15 years from now, calling it more of a concept than a concrete blueprint. One Business Insider writer covered a different self-driving car, riding in a Volkswagen featuring Valeo technology. He speculated that self-driving cars might not be completely on autopilot; instead, it’d be used during situations a human driver would find boring — highway or traffic-jam driving — while the human driver plays Angry Birds on his phone. And “Jack,” the self-driving Audi A7, successfully made it to CES in Las Vegas on Tuesday, Digital Trends reported. The car left San Francisco on Monday. But fewer cars could mean lower volume for shops, particularly if the cars themselves aren’t crashing as much. On the other hand, smarter cars could be much more difficult to repair after being damaged. This could lead to more billable hours and specialized services which could produce expanded revenue streams within a traditional collision repair business (good) but require expensive investments in shop infrastructure and employee training (bad). It also could hinder smaller shops and competitive pricing if only a few larger entities (dealerships, for example) are approved make the repairs on a customer’s Jetsons car. The Insurance Information Institute also projected fewer cars, pricier repairs, and intriguingly more liability concerns for manufacturers as a lawyer or competing insurer lays blame for a crash at the feet of a onboard computer instead of a driver. No-fault insurance or some sort of different method for paying victims (and tort lawyers) that wouldn’t stifle innovation were thrown out as solutions to that issue. Mercedes F 015 on the official Daimler AG site. Valeo Cruise4U on the official Valeo site.